We offer repair solutions for all sizes of LTO, 4mm, DLT, SDLT, 8mm, VXA, AIT, 3480, 3490, 3490E, Travan, QIC and 9 track reel-to-reel, tape libraries and autoloaders. 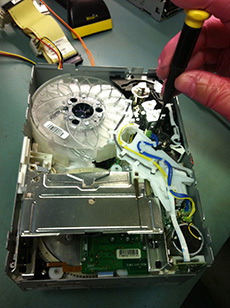 Techware has been providing professional tape drive repair services for the past 15+ years, saving our customers thousands of dollars by keeping their tape drives running years beyond the warranty periods. No charge for unrepairable drives. Brands that we work on include: Dell, HP, IBM, Quantum, Sony, Exabyte, Seagate, Compaq, Sun Microsystems, Overland Data, Cipher, Fujitsu, Breece Hill, Adic, StorageTek, Tanberg, WangDat and many more. How do you get your repair started? Simply call us at (952) 944-0083 x-15, or toll free 800-295-0083 to get the repair service started. 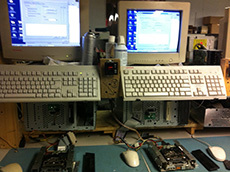 Or you can send us an email via our repair form to the right. We will respond within a few minutes during business hours Monday - Friday. 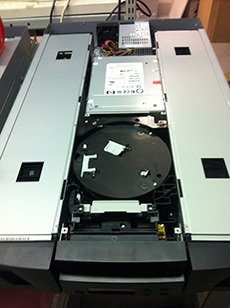 Upon receiving your tape drive or library, we thoroughly inspect your drive, clean it, test it, assess what is wrong, then we contact you with an accurate estimate of the total repair costs. No surprises. Once you give us the go-ahead we upgrade the firmware, replace the worn or defective parts and align the head. Board replacement is commonly required. Once the repair process is complete, a final bench test is performed to ensure that your drive is again functioning at the original factory specifications. You get a 6 month parts and labor warranty on our repair work. Our normal repair time is just 4-7 working days, not counting shipping time in or out of our centrally located Minneapolis, Minnesota repair facility. We have an expedite service option that cuts the repair time down to 2-3 days for an additional fee of $100. In addition we all speak clear English, a little Spanish, and will treat you with prompt and professional attention to your needs. That is why we are better than our competition. We offer multiple drive discounts to service companies or organizations with multiple tape drives at multiple locations around the country. Please inquire with your specific repair details.